Who wouldn’t want to sit poolside with these adorable bears? I saw this idea on Pinterest and knew I would have to make them one day. They are so simple to create and so fun to eat. My kids had a blast eating them with their friends. Who doesn’t like jello and cool whip together? Shh, don’t tell anyone but actually, I don’t like jello at all. Never have, likely never will. The texture of it is something that I have never been able to enjoy, not even as a child. 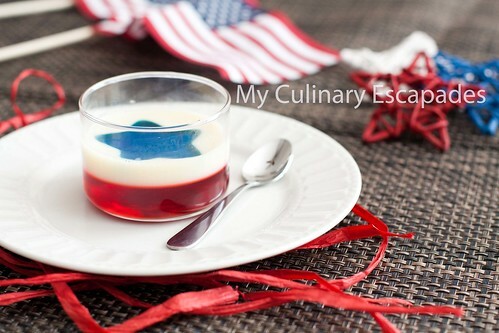 However, jello is my favorite thing to create treats out of. People love the stuff. In fact I haven’t met another person who doesn’t. Jello is beautiful. You can pretty much manipulate it to do anything you want. 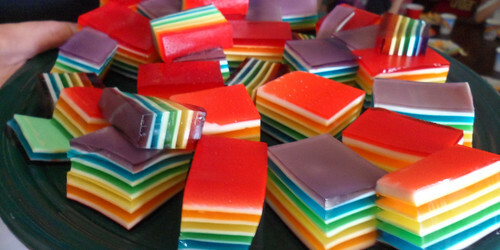 I have made my favorite treat of Rainbow Ribbon Jello countless times and each time I create it I am amazed by the beauty of it. My kids love to swim. Between swim lessons and swimming in our backyard they swim at least 2 times per day during the summer. They always ask to have friends over for a swim party and often I allow it. Having friends over changes things up and everyone is more harmonious. Nicole and I love to get the kids together to swim, they can hang out and so can we. These little cups are a perfect treat for a swimming party on a hot day or just for dessert with your family. Combine jello with 2 1/2 cups boiling water and stir until well combined. Pour into individual cups and refrigerate until set. About an hour before serving put cool whip in a disposable icing bag and snip the tip off. Pipe onto half of the jello. 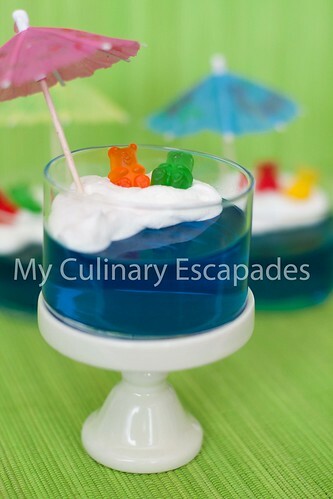 Place two (or more) gummy bears on the cool whip and open up a paper umbrella and stick it in the cool whip. One 6 ounce box of jello makes 6 pool party jello cups.